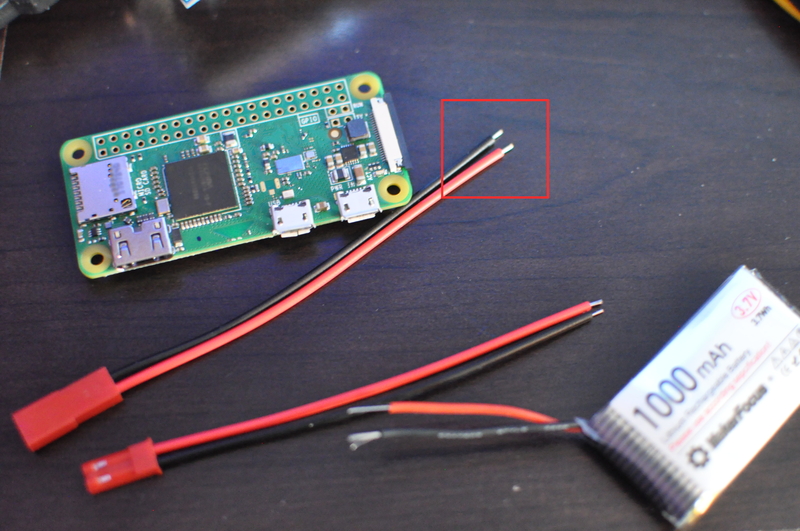 1) is it safe to use this battery and these wires with the raspberry pi zero? 2) if yes, where do i solder the highlighted (red square) ends to the zero board? If I were you, I would stay away from what you are trying to achieve, especially if I have no prior knowledge of the (electrical and/or electronics) specs. Instead, I would rather look for some much better alternative approaches, i.e. an inexpensive and ready made DC power source, a LED Flashlight with a built-in USB power port source, any inexpensive pre-paid Android smartphones (if you live in US, Black Friday sale is coming soon and chances are there will be some offers for any inexpensive pre-paid Android smartphones with at least a 2 Ah battery for under US $10 or even less). For instance, I would invest my money on any USB mobile power bank. The link to battery you provided above indicates the battery capacity is 1 Ah with a price tag of $17.99. If you shop around with that budget, you certainly can get a good and decent 20 Ah USB mobile power bank and some do come with a USB male to USB micro male cable that is ready to plug into the micro USB port on an Rpi0. No gimmicks, hassles, and/or guessing works on which DC/DC converter to buy, what cable to use, etc. If you would prefer to build a USB mobile power bank, have a look here for the parts from AliExpress. You may also be able to scour the parts from eBay with a better price, too. PS: If you contemplate to get an inexpensive 20 Ah USB mobile power bank, please be sure NOT to get the one with a built-in solar panel. The panel is to small to produce enough current to charge the battery even under a hot bright sun light. To make the matter worse, the charging LEDs drain more current than the solar panel can produce. As such, if you were trying to charge the power bank under a bright sun light, the LEDs will just completely drain the current from the power bank, let alone the heat from the sun light will decimate the batteries life of the power bank. Not the answer you're looking for? Browse other questions tagged power power-supply pi-zero pi-zero-w battery or ask your own question.